Tacoma, Wash. (April 15, 2019) – Milgard® Windows & Doors earned the top award for quality vinyl windows nationwide for the ninth time from BUILDER Magazine, the leading media brand for the residential construction industry. Tacoma, Wash. (Feb 12th, 2019) – Milgard Windows & Doors was named the highest online rated window and patio door brand for the third straight year, demonstrating their continuing commitment to manufacturing quality products and delivering great customer experiences. Tacoma, WA (Nov 29, 2018) – Milgard Windows & Doors announces a milestone with the National Fenestration Rating Council (NFRC) as they celebrate twenty five years of continuous partnership with the organization. Tacoma, Wash. (Oct 18, 2018) – Milgard Windows & Doors, with the support of Masco Corporation, raised over $35,000 for the National Multiple Sclerosis Society through their participation in Bike MS, putting them in the top 10 of company fundraising for the third year in a row. Tacoma, Wash. (Oct 8, 2018) – Milgard Windows & Doors is celebrating its twenty year partnership with ENERGY STAR® by offering homeowners $10 Amazon.com gift cards with every Style Line® Series window purchase, $20 gift cards with every Tuscany® Series window purchase and $50 gift cards with every Tuscany Series patio door purchase through November 15, 2018*. Tacoma, Wash. (Sept 5, 2018) – The Milgard® Essence Series® wood interior, fiberglass exterior, window and patio door line was named among the 100 most popular products in Professional Builder Magazine, as determined by its readers. Tacoma, Wash. (July 30, 2018) – Milgard Windows & Doors is partnering with Goodwill of the Olympics and Rainer Region to help eliminate career advancement barriers and bring growth opportunities to non-English speaking Milgard employees in Tacoma, Washington. Tacoma, Wash. (May 22, 2018) – For the 6th year, Milgard Windows & Doors worked with Tacoma/Pierce County Habitat for Humanity to help beautify and prepare homes in preparation for low-income families to move in. Tacoma, Wash. (Feb 7th, 2018) – For the second year in a row, Milgard® Windows & Doors was named the highest online rated window and patio door brand, as determined by MetrixLab’s Net Reputation scoring system. Tacoma, Wash. (Feb 1st, 2018) – Milgard® Windows & Doors has recently received Best of Houzz in Design for the 4th year in a row. Tacoma, Wash. (Jan 2th, 2018) – Milgard Windows & Doors is celebrating 50 years of manufacturing quality patio doors by offering homeowners a $100 Amazon.com gift card with any Tuscany® Series, Montecito® Series or Aluminum Series sliding patio door or a $200 Amazon.com gift card for any Moving Glass Wall System purchased through February 28, 2018. Tacoma, Wash. (Nov 15th, 2017) – Milgard Windows & Doors, in partnership with Goodwill of the Olympics & Rainier Region, is holding a community clothing and household goods drive on November 28, 2017 from 9:30am – 12:30pm. Tacoma, Wash. (Sept 26th, 2017) – Milgard Windows & Doors, with the support of Masco Corporation, raised over $27,000 for the National Multiple Sclerosis Society through their participation in Bike MS, putting them in the Top 10 of fundraising companies. Tacoma, Wash. (Sept 12th, 2017) – The ABC Green Home 3.0 won the Gold Nugget Award for Best Zero-Net Energy Design in an Orange County, California home that was designed using Milgard® energy efficient vinyl windows. Tacoma, Wash. (Sept 5, 2017) – Milgard Windows & Doors is pleased to announce the appointment of Vishal Singh as President of the Company. Tacoma, Wash. (Aug 8th, 2017) – Employees at Milgard Windows & Doors donated their time to Tacoma/Pierce County Habitat for Humanity by participating in their annual Build Day, preparing homes for low-income families to move in. Tacoma, Wash. (Aug 1st, 2017) – Milgard Windows & Doors provided a $25,000 donation to World Vision, a Christian humanitarian organization dedicated to working with children and families tackling poverty and injustice, to support their Teacher Resource Center (TRC) program. Tacoma, Wash. (June 2nd, 2017) – Milgard® Windows & Doors earned the distinction of being the highest online rated window and patio door brand for all of 2016 and through the most recent reporting period of Q1 2017, as determined by MetrixLab’s Net Reputation scoring system. Tacoma, Wash. (May 23rd, 2017) – Milgard® Windows & Doors was recognized as the “Brand Most Used” in the Western U.S. for both their vinyl and fiberglass window products in the 2017 Hanley Wood BUILDER brand study. Tacoma, Wash. (April 25th, 2017) – Milgard® Windows & Doors partnered with Peninsula Publishing, in partnership with SoCalGas, and Southern California Edison, in collaboration with Habitat for Humanity of Orange County, by providing Style Line® Series energy efficient vinyl windows to the newest ABC (Affordable, Buildable, Certifiable) Green Home Project. 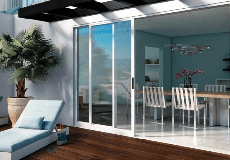 Tacoma, Wash. (April 11th, 2017) – Milgard® Windows & Doors has added to the innovative Essence Series® product line with the introduction of in-swing and out-swing French patio doors, combining the beauty of wood with the durability of fiberglass. Tacoma, Wash. (March 28th, 2017) – The American Architectural Manufacturers Association (AAMA) recently recognized Milgard® Windows & Doors with the Chairman’s Award, their highest company honor, at their 80th Annual Conference. Tacoma, Wash. (March 14th, 2017) – Milgard® Windows & Doors recently launched a new blog designed to provide tips and inspiration to homeowners. Tacoma, Wash. (Jan 26th, 2017) – Milgard® Windows & Doors was awarded Best of Houzz in the Design category for the 3rd year in a row making them the only window brand on Houzz to receive this honor. Tacoma, Wash. (Jan 10th, 2017) – Milgard® Windows & Doors was awarded Best Vinyl window product in the 2016 Building Materials Brand Preference Survey conducted by Peninsula Publishing. Tacoma, Wash. (Dec 29th, 2016) – In the spirit of giving back locally, Milgard® Windows & Doors provided gifts and holiday cheer to the Boys & Girls Clubs of South Puget Sound for the 4th year in a row. If you are a press member looking for product information, photography or would like to order a press kit, please contact us. If you are a customer looking for product service information or would like to contact a local Milgard sales office, please contact Milgard Customer Service at 1.800.MILGARD (1-800-645-4273) or via the contact us form.